Henry Dagg is a composer and sound sculptor who has worked with many well known acts including Keane and Bob Geldof. He has been designing electronic and acoustic instruments since he was nine years old, and last year he even played his homemade cat piano to Prince Charles and Camilla. M : How did you get involved with Björk ? 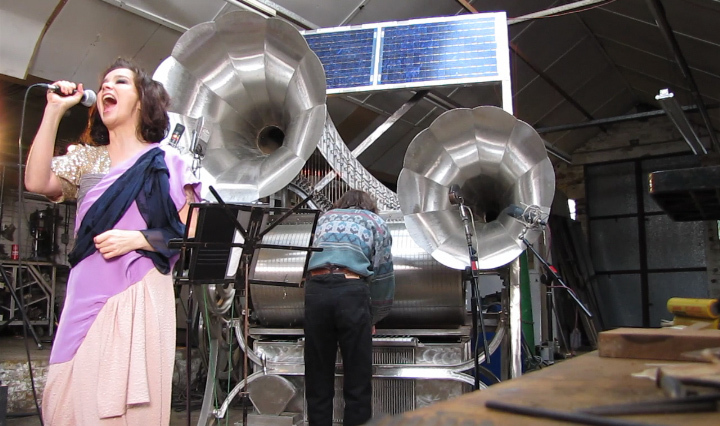 Henry : Between 2006 and 2010 I designed and built the Sharpsichord [also known as a pin-barrel harp] as part of a sound sculpture commission from the English Folk Dance & Song Society, which was meant for installation in the garden of Cecil Sharp House in London. Its purpose was to allow the public to compose their own music by placing pins on a cylinder, which could then be turned to play their composition on a 46-string chromatic harp. During its development I had been arranging songs and recording them with various singers, then posting the video performances on YouTube. Last year, Nick Kenny, a local artist friend was discussing some work with Matthew Herbert, and he pointed him to one of these clips. Matthew had been working with Björk, and he sent her a link, and pretty soon I had an email from her asking about the possibility of working together on a song with the Sharpsichord. M : At what stage did you get involved in the Biophilia project ? H : Björk spent three years planning Biophilia, and to reinforce the educational aspect of the app format, she had initiated the development of a number of instruments which relied on basic acoustics and physics for their operation. Although she only discovered the Sharpsichord at the end of the planning process, I think she recognised that it had an affinity with her other work, and felt that its unusual, acoustically generated sound fitted in well with her existing concept. M : How was Björk’s music reinterpreted for the Sharpsichord ? H : Björk and I exchanged a lot of emails for some months while working on Sacrifice because the song in its original form could only have been realised by editing together six separately-recorded cylinder programmes. However, what she actually wanted was to sing the whole song beside the machine as a live performance. The track had more sections than the cylinder could accommodate, the structure was roughly A-B-A-C-A, and she explained that the nature of the lyrics gave her difficulty in editing it, so in the end I simply had to compress it to the minimum possible number of bars, and programme a skeleton section at B over which I would play two differing live parts on the Sharpsichord keyboard based on her original score ; one to resemble B on the first rotation, and another to resemble C on the second rotation. 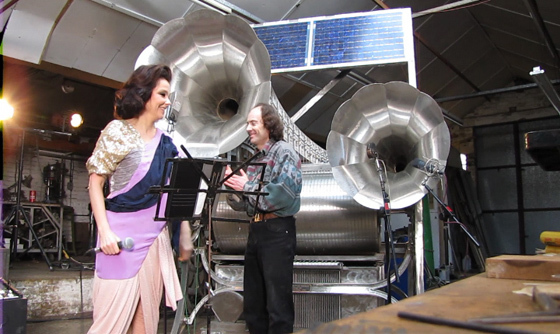 For the recording, Björk came over to my workshops in January where we recorded it together for both the album and her documentary film crew. M : What part did the Sharpsichord play in the live show ? H : It simply played the same programme I had made for the original recording of Sacrifice, which required me to perform the same keyboard parts live also. Although the parts aren’t difficult, getting all the notes right and in time isn’t easy, because the transmission is mechanical, with a long chain of linkages and springs between keys and action, so the keys are spectacularly hard work to play. Although it was the sole instrument as in the original recording, Björk had added a very effective choral part for a couple of sections for the live show. M : What was it like working with Björk on such a distinct and ambitious project ? H : It was very hard work for months beforehand, because the Sharpsichord was only designed to be dismantled and permanently installed, and converting it into a unit which could be moved in one piece was a massive job which I only completed by the day before it had to travel. Once it was at the venue in Manchester, all the pressure had disappeared and I could really appreciate what an appropriate setting it had for its first ever public appearance, surrounded by similarly unusual and sculptural instruments. As in the recording session, Björk and all the crew were very amiable and easy to work with, and it was a very good experience overall. Many of her fans approached me after each show, full of questions and excitement about the harp. M : You used to work for the BBC didn’t you ? H : Yes, but I’ve been a composer and sound sculptor for the past 20 years. It’s essentially what I’ve always done. It’s an allied pair of interests which go back as long as I can remember. From a very early age I was building oscillators and sound generating devices and playing musical instruments. From the age of nine my main ambition was to join the BB Radiophonic Workshop. I could see that was the working environment that suited my basic interests most closely. So joining the BBC in 1974 on the audio side was basically me just trying to follow in the footsteps of what John Baker and Delia Derbyshire were doing. M : So, were you composing all that time too ? H : I’m trained on the cello, and played keyboards and electric bass right through my teenage years. I joined the BBC and got absorbed more specifically in sound engineering for radio and TV specifically. Around 1982 I started composing. Of course a lot of it depended on having the facilities to work in. It wasn’t really until I had my own house that I was able to set up the sort of workshops that allowed me to do the engineering side of things, which has always been a big part of my music. When I started composing, I was using equipment I had built myself in order to use tape machines as samplers. Although digital sampling did come in during the 80s when I was composing, it wasn’t affordable until quite a few years later. For a lot of that time I was using tape machines because it was the only technology I had. To create the sort of music I wanted to create I was using real sounds and cloning them. It was fairly constructed but I developed a number of techniques. I build a chromatic speed control for the tape machines and a calibrated editing block – all the things I would need to work with tape precisely. I could put together my compositions, which were always polyphonic over multiple tape machines. I found out through talking to John Baker in 1983, when I did go for a short attachment at the Radiophonic Workshop, that in fact the technique was the mainstay of what they had used. From that time on I was doing a lot of commissions for radio and TV. M : Has there always been a close relationship between the equipment and sculptures you make and the music you create ? H : They are yes, they work very closely. When I’m developing new instruments or sound sculptures I’m thinking as much as a musician as anything. It’s led by the idea and the quest for a new interesting sound. One of the reasons I’ve slightly neglected compositions recently is that I’ve been concentrating on my workshop, which is a shame really, because in the end, that’s what I’m trying to work towards. Having used synthesisers and samplers for such a long time I got slightly disenchanted by the fact that the end result wasn’t really capable of a live performance, it was very much based in studios. It had to be engineered into being, rather than being performable. That’s why in more recent times I’ve been gearing up to creating a set of instruments that allow me to perform my own music live. In the end I have to find some way of existing through all of this, and like most musicians, I have to live on practically nothing ! M : How about commissions ? H : Yes, those are helpful. Certainly the Sharpsichord wouldn’t have existed without a commission. It really ticked all the boxes for me, but I have, over the years, had to do some that didn’t advance me musically. The TV and radio commissions were interesting and challenging, but it was difficult to do when I left the BBC because I didn’t have a studio for a while. Recently, I have been trying to maintain the live and composition work. Last year I played with Bob Geldof and Keane, and of course, Prince Charles and Camilla. I did the Jools Holland Hootenanny earlier in the year. M : What did you do with Bob Geldof and Keane ? H : They were both in my musical saw role. I’m fairly well known in musical saw circles internationally, having won competitions in California in the 80s. M : So you are the ‘go to’ man for musical saw ? H : Well I should be, but self-promotion is not one of my talents ! M : I understand it took four years to build the pin barrel harp, what was the thinking behind it ? H : The sort of generic sound sculpture that makes generic sounds that are interesting, aren’t necessarily easily harnessed by conventional music. So I felt was Cecil Sharp should have something that did allow compatibility with existing instruments, in terms of scales and predictable rhythm and all the rest of it. M : What do you have lined up next ? H : Ever since the Sharpsichord became a performing instrument, I have been collaborating with a number of other musicians and singers. I’ve been working with a wonderful singer-songwriter called Hannah Peel. She accompanies herself on a programmable music box and she approached me to collaborate. She said it seemed the obvious progression from her music box ! She proposed a list of tunes that we could do and we chose two. She chose the Tears for Fears track Head Over Heels and another was God Only Knows by the Beach Boys which I thought would be a great vehicle for her voice and the Sharpsichord. We recorded both of those. She’s singing with Laura Groves from Blue Roses on God Only Knows. I’m always looking for other vocalists who would like to work on it, and I would like to compose for it too.